Add half of the water to the blender, then add all ingredients and blend well. Add more water if needed. 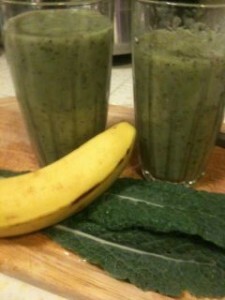 Keep the remainder in the refrigerator and add more water as the chia seeds will thicken the smoothie. Chia seeds are excellent for you. These seeds are the most abundant plant source of omega 3. They also help to balance blood sugar, contain lots of fiber and will make you feel full for hours. Add pre-soaked chia seeds to your smoothies and juices. Just be sure to drink lots of water whenever you use chia seeds.